Okay, it doesn’t look like much until you zoom in closer. The grayish-mound is a solid mat of oval, wrinkly seeds. Apparently they had been gathered and stored by the Southern fire ants (Solenopsis xyloni) you see running around. The ants were in full defensive mode. The seeds were both on the ground and on the underside of the rock, so there was quite a mass of them. 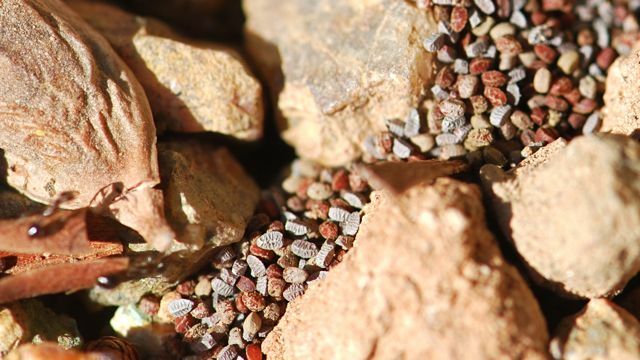 Seeing the seeds reminded me of an earlier time (above photograph) I had found a similar cache of seeds under a rock . At the time I didn’t know what plant they were from, but now I have figured it out. These seeds are from a type of ground spurge, Chamaesyce prostrata. Another common name is sandmat. 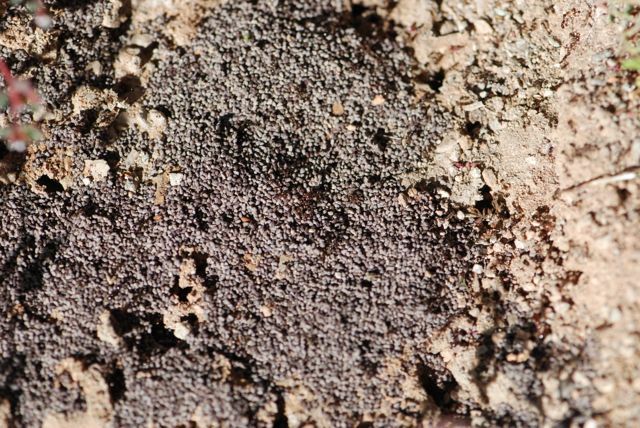 (See post about Southern fire ants and sandmat). The University of Arizona has an illustration of the plant in their older weed manual under the name Groundfig Spurge, Euphorbia prostrata. See the seed labeled “d” in the illustration? 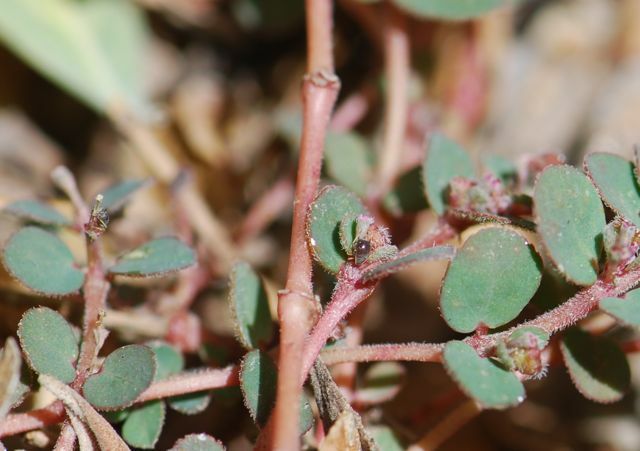 A quick search of the internet revealed the UC IPM website states “Weed seeds, particularly spurge, may attract the ants away from the bait…” This statement is referring to Southern fire ants in almond groves. Seems like there might be something worth investigating going on here. 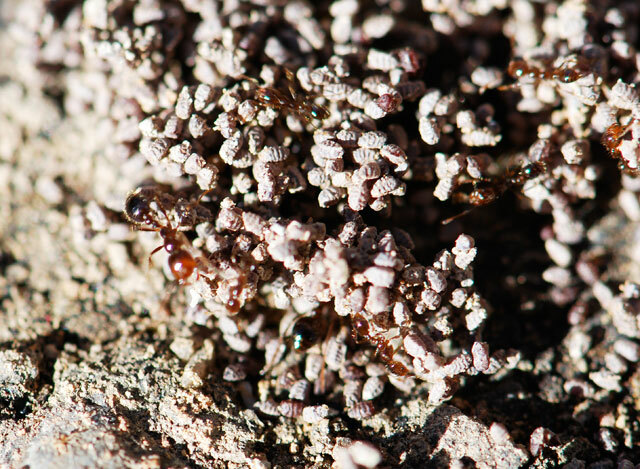 Have you ever seen Southern fire ants with seed caches? What kinds of seeds did you find in them? Have you ever heard a gardener comment, “Spurge plants always have ants,” and wondered if it was true? 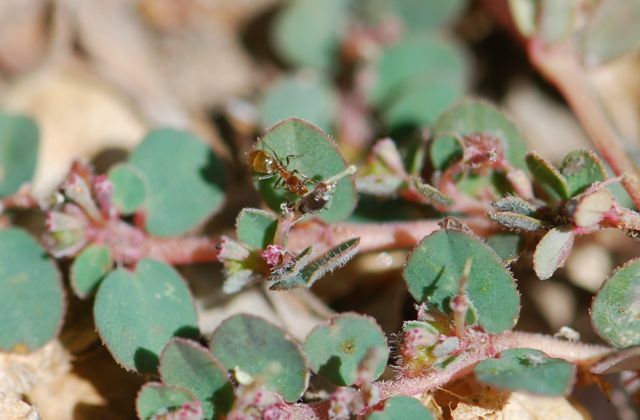 I admit searching ground spurge (Chamaesyce prostrata) for ants when I find the weeds, and I am often rewarded. Ants are attracted to spurge seeds (previous post), but is there more to the story? Let’s take a look at a spurge with numerous ants milling around it. Most are Forelius. The ants seem to be visiting the complex structures that pass for flowers in ground spurge. In this photograph the ant on the right appears to be visiting the flower. But there is also an aphid on the same plant. Yes, there are aphids on the plant. The ants are also collecting honeydew from the aphids. This leads to the question, how significant are the two sources of sweets? Ants are known to regularly visit the nectaries of the invasive weed, leafy spurge, but I wasn’t able to find out much about ground spurge. 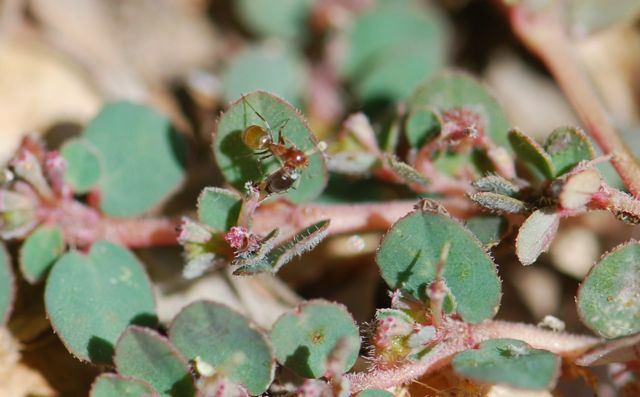 Another question arises about whether ants might be capable of pollinating ground spurge. 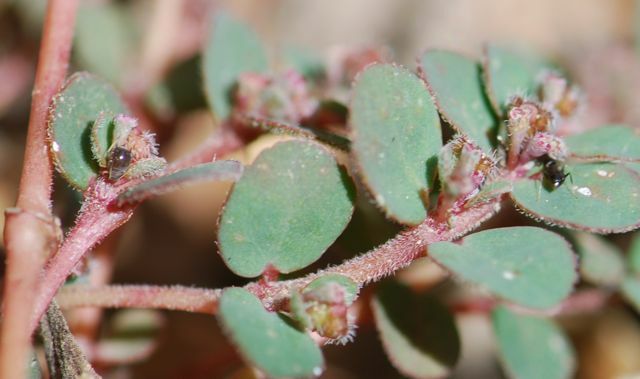 Ants are thought to pollinate certain low-growing plants with small flowers that are tight to the stem, and ground spurge certainly fits the bill. Selleck, et al. 1962 reported that leafy spurge was pollinated by ants. After reading their evidence, however, it might be a shaky conclusion. What is up with ants and spurge? 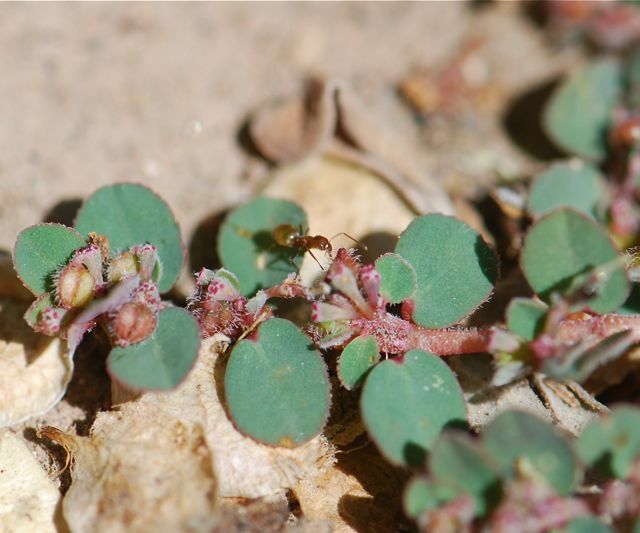 Do ants visit spurge where you live? Do the ants gather nectar? Any evidence of pollination? Selleck, G.W. ; Coupland, R.T.; Frankton, C.(1962). Leafy spurge in Saskatchewan. Ecological Monographs. 32:1-29. free .pdf.